A refreshing, low-calorie iced tea mix you can feel good drinking because it is sweetened with honey and made from real tea leaves and fruit flavors. That's why it's made with rich and delicious honey. 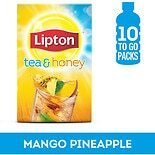 Trust the tea experts at Lipton to bring you real tea leaves in a convenient, easy to use instant packet you can have on hand at home or anywhere you are on the go.